Here’s a story that many mothers know well: first came a career, then came a baby, then came a colossal shift in perspective that made her rethink everything, and led her down a completely new career path. 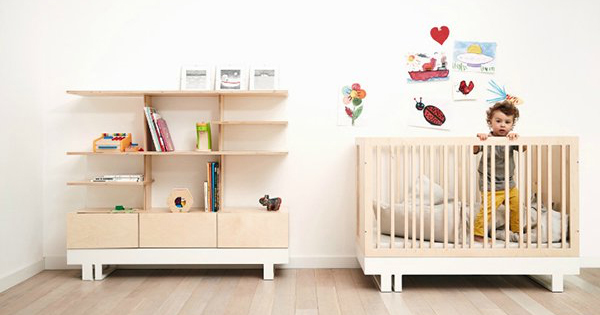 That’s the story behind Kutikai, a gorgeous nursery furniture and accessories brand from Poland. The founders are two mums who met in architecture school, went off and had families, and then realised life had changed forever. They set out to create a brand of nursery furniture that reflected their background as architects, then combined it with the imagination, curiosity and whimsy of childhood. Kutikai designs are pared back, with unexpected angles and features – just what you’d expect from a couple of architects. Every piece is lovingly handmade in a family carpentry shop, and the wood is finished with a clear organic lacquer. We love the beautiful toddler-bed-toy-house (approx. $910) with its lofted roof and little windows to peek out of. It’s cleverly designed with longevity in mind; it starts life as a cot, and with the addition of a few genius convertible pieces, turns into a toddler bed. Its match is a little cottage-shaped drafting desk ($367), complete with a built-in pencil holder. Add the bookcase (pint-sized so tiny hands can reach the shelves) and you’ve got the perfect kids’ bedroom suite. Kutikai’s second collection, loosely translated to “Holes”, also has all the modular goodness we’ve come to love from this brand. The tallboy (about $1015) is a master changing station with easy-access drawers and cabinets for storing nappies and other baby essentials. The change table-top lifts out and can be stored away as little ones grow older. There are two sizes of cot available (about $910-$1085), and both convert into toddler beds, complete with a safety barrier to keep active dreamers from tumbling out of bed. Kutikai’s clean designs are perfect for inspiring imaginative play. Shipping to Australia isn’t available yet, but we’ll update you when it is.